India is a land of rich biodiversity; with various cultures and traditions, which have worked in nurturing and preserving its natural wealth. However due to population explosion and its ever increasing needs and demands, there is increased pressure on the environment. The tradition of conservation is soon becoming extinct. It is not possible to return to those times, but we can work on a new culture for conservation from what has been handed down to us since centuries. The rural population still depends on forest resources, rivers and wildlife commodities for survival. Several species and ecosystems have come under severe threat due to depletion of resources and global warming. Before we reach an irreversible crisis, we need to stop and start working towards conservation with a strategic approach. Each individual can be a leader in evolving better and newer ways in conserving resources. Environment agencies are working towards this but most of the time, the centralized institutional system does not work at the ground level. For that, there needs to be interaction with people who are working in the field, as they are the ones who have evolved and developed the means and measures to conserve nature with the available resources in the most efficient manner, understanding the ground realities. The motive of this program is to discuss the current scenario and thrash out new ideas and strategies. With this as the backdrop, and over 13 years of experience in ground level conservation, anti-poaching, and rehabilitation work, Tiger Watch opens registration for its next in the series of Leadership Conservation Courses and looks forward to impart knowledge that can be invaluable to those making or wanting to make a sincere and serious effort towards conservation. Applicants must be 18 years and above. The course is intended for people who are currently involved in conservation, students, wildlife writers, or simply those interested in wildlife conservation. The number of participants will not exceed 25. Participants have to make their own arrangements to reach Sawai Madhopur. The participants are expected to be present by noon of May 17, 2011 i.e. the first day of the course. Mode of Payment: Cheque or demand draft in favor of “Tiger Watch”. Program involves talks and close interaction with the following personalities. state-of-art 60-bed hospital for villages near the park area. He is a true icon in community conservation. for tiger conservation. He has also provided valuable insights into the future trend of conservation, environmental policies, strategies and impact. Ms. Faith Singh: In 2002, Ms Singh founded the Jaipur Virasat Foundation she stepped down in 2007, and now takes a mentorship role. In the past five years, Ms. Singh has positioned JVF to promote values of sustainable development, social inclusiveness, and cultural conservation in its local context. In 1970, Ms. Singh and her husband started Anokhi, a textile company, in Jaipur. Prior to relocating in Jaipur, she worked with a local rural community in Spain and helped to augment their income through cottage industry activity. Ms. Singh studied French and philosophy at Sussex University. Dharmendra Khandal: With a doctorate in botany, Dharmendra is the country’s foremost spider expert, and a connoisseur of Rajasthan’s flora and fauna. 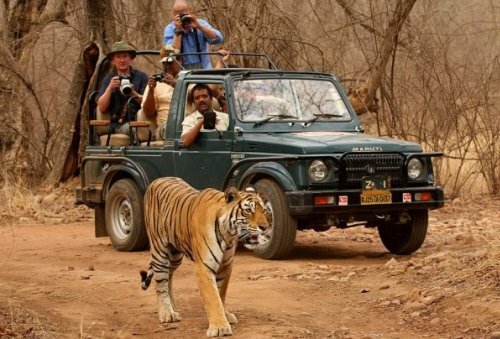 Dharmendra has been working at the ground level for tiger conservation since the past 9 years. A futurist in anti-poaching and wildlife conservation, he has not just helped governmental agencies get hold of poachers but also established ethics and methodology in anti-poaching strategies. He has religiously taken up the work of rehabilitating poachers’ families.